What Were The Sounds of Lemuria? Where or what is Lemuria? There is no simple answer except to suggest that it was said to have been an extremely large land mass in the Pacific Ocean which sank many thousands and thousands of years ago. It was also said to have had a highly developed civilization and that much of the mystic knowledge of the ancients came from Lemuria. There is an astounding amount of “channeled” information on Lemuria that is currently available. I cannot personally attest to the validity of this information, however, over 25 years ago while on the island of Bali in the South Pacific, I received information that this island was a remnant of that sunken continent, as was much of the Mayan empire. More recently, I was told that parts of New Zealand and Australia represented regions of Lemuria that had not sunk. There is also an abundance of lore through the Pacific on islands such as Hawaii, Easter Island, and Nan Madol regarding connections to the ancient Lemurian culture. With regard to the mythic sunken land mass of Lemuria there are numerous thoughts, theories and books on the subject. I’d like to suggest that from my own meditations and understanding, Lemuria was populated by extremely spiritually inclined beings who worked with many elements of the sacred including sound, geometry, and higher consciousness. Perhaps the oldest book on Lemuria currently still in print is “LEMURIA—The Lost Continent of the Pacific” by Wishar S. Cerve. The book, initially published by the Rosicrucians in 1931, presents a lot of information on this mythical land mass. While I admit that many of the writings on Lemuria must be viewed as highly speculative, from my readings of other classic Rosicrucian books, I have often found their material to have merit. One day recently while rereading this book, I went into a deep state of meditation. During this meditation, I was guided to combine specific tuning forks in a manner that I believe is a first—at least for this lifetime. This inspiration led to the creation of The Lemurian Tuning Forks. The frequencies in this set are based on a fundamental of 432 hertz harmonized with 2 major sacred ratios: Pythagorean Triples and Phi. Pythagorean Triples are a special form of the Pythagorean Triangle. This shape is a triangle named after Pythagoras (the ancient master of both sound and geometry) which creates a right angle whose sides are in the ratio 3:4:5. This form makes up the basis for many interesting sacred geometric forms. Phi, a mathematical ratio often referred to as the Golden Ratio, is an irrational number (a number that never ends) that reduces down to 1.618. This ratio manifests the spiral of the universe. But regardless of your knowledge of mathematics, I can assure you that with The Lemurian Tuning Forks, as with many of my projects, I was first guided to use the particular sounds long before I realized their significance. 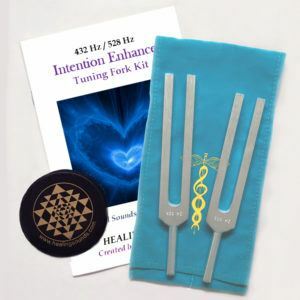 In truth, I’m not sure I have yet to grasp the true significance of these tuning forks, but I will acknowledge they seem to have great power—especially for amplifying energy and helping us attune with higher aspects of the cosmos. 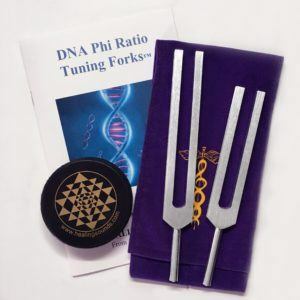 I like to believe that these tuning forks put us in touch with the Lemurian Energy and the energy of all beings of ascended consciousness. Thus, from my perspective, the purpose of The Lemurian Tuning Forks is to use the natural ability of their specifically focused sounds to assist in opening and enhancing the spiritual activation of our consciousness, much the same as was said to have occurred in Lemurian Times. I’m happy to present these forks as experiential tools for transformation. 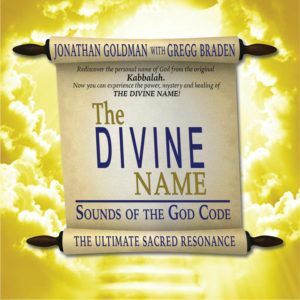 I welcome your feedback both regarding experiences with these frequencies, as well as additional thoughts about the question “What were the sounds of Lemuria?”. PreviousPrevious post:What is a Merkaba of Sound?NextNext post:A Modern Master of Sacred Geometry: Donald Duck!